Raw milk is dangerous. It is not safe and it can kill. UPDATE: Raw milk recalled after death of 3 year old. The Australian Competition and Consumer Commission says that Mountain View Farm has recalled its raw milk products after “negotiations” between the consumer watch-dog and the raw milk supplier, according to The Guardian Australia. The owners of Mountain View Farm, the producers of the milk that was allegedly drunk by the sick children say that the warnings on their label are clear and what consumers do with the product once they got home was up to them. 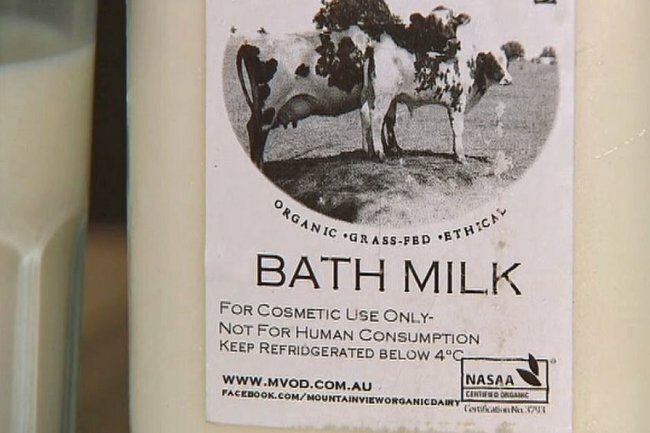 The farm owner, Vicki Jones said she was shocked by news of the toddler’s death, but said the dangers of raw milk had been sensationalised by the media. “I’m in shock, I think it’s a bit sensationalised,” she told Radio 3AW on Thursday. 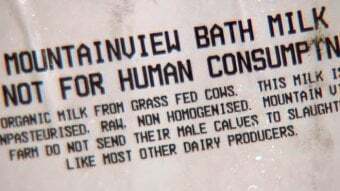 The Guardian notes that while the product comes with a warning that it is for “cosmetic purposes only”, posts on the Mountain View Farm’s social media accounts link to others espousing the benefits of drinking raw milk. The mother of a boy who fell ill after drinking raw milk has spoken to the media about her horrifying experience and the near death of her little boy. Her son was one of four children who fell catastrophically ill as a result of drinking “bath milk” that was labelled “not fit for human consumption”. She also said that her son had 20 percent kidney function as a result of contracting hemolytic-uremic syndrome – a serious complication of an E.coli infection. The mother also spoke out about how she had been “blinded by the latest trends,” adding that she would need to make informed decisions for her family in the future. “If I had heard of anything like this happening to anyone I wouldn’t have brought into my home – I wouldn’t have consumed it myself,” she said. A three-year-old child is dead. Victoria’s Health Department say that the child died as the result of drinking something you can buy in your health food shop right now. The label will tell you it’s not for drinking, but its packaging and positioning will tell you that it’s just an alternative to something that is probably part of your regular diet. The label will tell you it’s not for drinking, but an increasing number of families around Australia are consuming it today. The label will tell you it’s not for drinking, but these families are using it because they are being convinced by an ever-growing ‘health’ movement that it’s safe because it’s raw and unprocessed. Raw milk is not safe. It is dangerous and it can kill. Health authorities in Victoria say that this child is dead because he drank a brand of organic raw milk – deliberately or accidentally we may never know – and that four other Australian children have fallen ill in the same way. Despite the tragically clear dangers of consuming untreated milk, there is still a substantial movement of people who are promoting its consumption – often pedalling claims about its supposed health benefits in treating everything from asthma and allergies to heart disease and cancer. 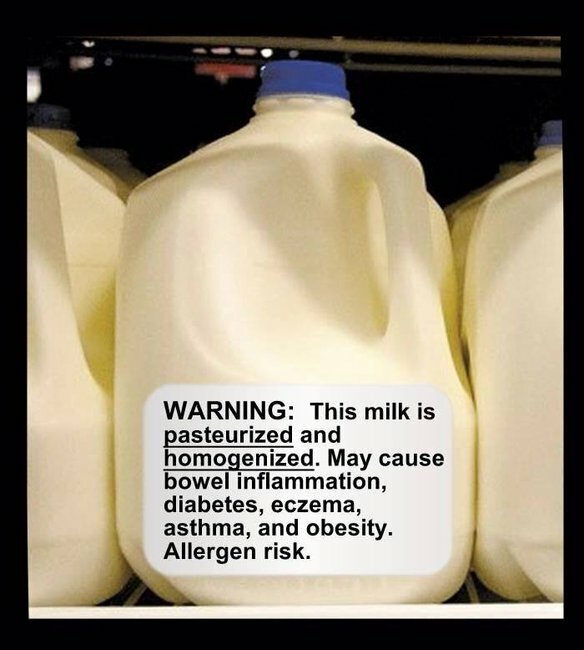 In light of these risks, it’s time for those who continue to recommend raw milk to take some responsibility for the misinformation that is associated with this dangerous practice. 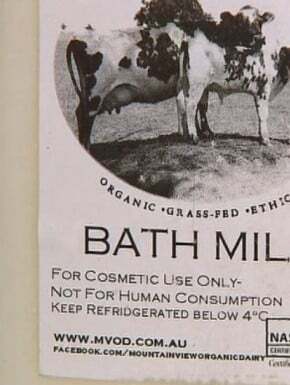 The label saying “bath milk not for human consumption”. Raw milk is cows’ milk that has not been pasteurised (heat-treated to remove harmful pathogens). 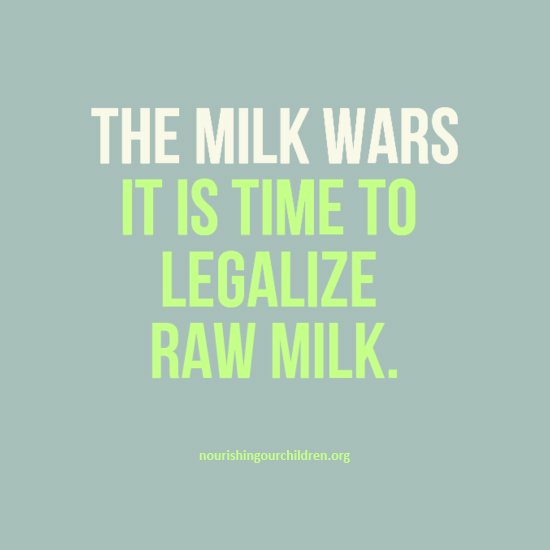 The sale of raw milk is illegal in Australia. It can, however, be legally sold in similar packaging to regular milk and marked as ‘bath milk’. The fact is that raw milk can be found by anyone who wants it. Consumers either purchase the ‘bath milk’ on sale at health food stores or obtain milk from farms, including those involved in cow-share programs (where people purchase shares in cows and then pay for their board in exchange for access to raw milk). 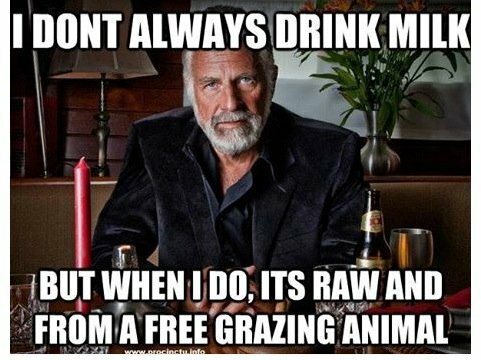 Via a pro raw milk Facebook page. The risks are most significant for young children, the elderly, pregnant or people who are unwell. Victoria’s Chief Health Officer Rosemary Lester said today that she is worried that unpasteurised milk was intentionally being given to children despite being labelled not for human consumption. She is particularly concerned about “the movement out there that people think that something raw is wholesome and better for you, which is clearly not the case”. So who are these people who are promoting the consumption of raw milk? But health authorities are clear on the risks associated with raw milk.The Australian food standards setting body, Food Standards Australia and New Zealand has undertaken an extensive assessment of raw cow’s milk and concluded that the risk to the public was too high to change the current requirement for pasteurisation. The myth of the benefits of drinking raw milk have also been debunked. Whether it’s asthma, allergies, cancer or heart disease, there are no health benefits from drinking raw milk that cannot be obtained from drinking pasteurized milk that is free of disease-causing bacteria. FSANZ assessed the evidence concerning the difference in health and nutrition between pasteurised and raw milk and concluded there was not a significant difference. Pasteurisation does a small decrease in the amount of vitamin C and thiamine, however milk is not a major contributor of these nutrients to Australian diets. The process of pasteurisation does not cause chronic disease, allergies or developmental or behavioural problems. The benefits aren’t properly established. The risks are real. The risks are also not particularly surprising. Anyone who has ever milked a cow or worked in a dairy knows that it can be a messy process. You wear a hat because you will get shat on at least once a day. You wash the teats, but if the udder gets empty and you’re not fast enough, the milking machine cups will slip off the teats and fall on the ground. While bacterial counts are done regularly, it is very very easy for milk to become contaminated. This is why we have pasteurisation. Consider it this way: we don’t eat raw chicken. We don’t feed our kids raw meat. We prepare food so that it is safe for us and our families. Milk is the same. It needs to be prepared to make it safe. 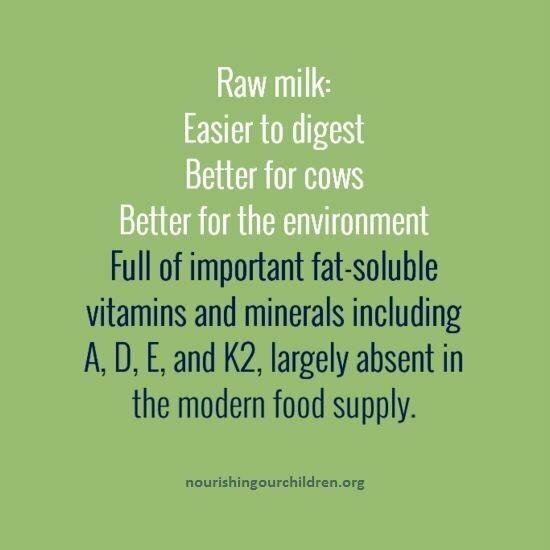 Have you considered drinking raw milk?